Known for: mother of Elizabeth Woodville, Queen of England, consort of King Edward IV, and through her, ancestress of the Tudor rulers and subsequent rulers of England and Great Britain. And through Jacquetta, Elizabeth Woodville was descended from several English kings. Ancestor of Henry VIII and all following British and English rulers. Accused of using witchcraft to arrange her daughter's marriage. More about Jacquetta's family is below the biography. Jacquetta was the oldest child of her parents’ nine children; her uncle Louis, later to be a Bishop, was an ally of England’s King Henry VI in his claim to the crown of France. She probably lived in Brienne in her childhood, though little record of that part of her life survives. Jacquetta’s noble heritage made her a fitting wife for the brother of England’s king Henry VI, John of Bedford. John was 43 years old, and had lost his wife of nine years to the plague the year before he married the 17-year-old Jacquetta in a ceremony in France, the ceremony presided over by Jacquetta’s uncle. John had served for a time as regent for the young Henry VI when Henry V died in 1422. John, often known as Bedford, fought against the French to try to press Henry’s claims to the French crown. He is known for arranging the trial and execution of Joan of Arc, who had turned the tide of the war against the English, and for also arranging for Henry VI to be crowned as French king. This was a fine marriage for Jacquetta. She and her husband went to England a few months after their marriage, and she lived both at her husband’s home in Warwickshire and in London. She was admitted to the prestigious Order of the Garter in 1434. Soon after that, the couple returned to France, probably lived in Rouen at the castle there. But John died at his castle a week before the end of negotiations for a treaty between diplomats representing England, France and Burgundy. They had been married for less than two and a half years. After John’s death, Henry VI sent for Jacquetta to come to England. Henry asked his late brother’s chamberlain, Sir Richard Woodville (also spelled Wydevill), to be in charge of her journey. She had dower rights to some of her husband’s lands and about one-third of the income from them, and would be a marriage prize that Henry could use to advantage. Jacquetta and the rather poor Richard Woodville fell in love, and married secretly in early 1437, thwarting any marriage plans King Henry may have had, and drawing Henry’s anger. Jacquetta was not supposed to be able to exercise her dower rights if she married without royal permission. Henry settled the affair, fining the couple a thousand pounds. She returned to the king’s favor, which had considerable advantages to the Woodville family. She returned to France several times in her first years of the second marriage, to fight for her dower rights there. Richard was also assigned to France a few times. In addition to the connection to Henry VI by her first marriage, Jacquetta also had a connection to Henry’s wife, Margaret of Anjou: her sister had married Margaret’s uncle. Even as the widow of Henry IV’s brother, Jacquetta had, by protocol, a higher rank at court than any other royal women except the queen herself. Margaret was chosen, for her high rank and the connection by marriage to Henry VI’s family, to go to France with the party bringing the young Margaret of Anjou to England to marry Henry VI. Jacquetta and Richard Woodville had a happy and long marriage. They bought a home in Grafton, Northamptonshire. Fourteen children were born to them. Only one – Lewis, the second eldest, who was also the eldest son – died in childhood, an unusually healthy record for the time plague-ridden times. In the complex intrafamily feuds over succession, now called the Wars of the Roses, Jacquetta and her family were loyal Lancastrians. When Henry VI was in his extended isolation due to his mental breakdown, and Edward IV’s Yorkist army was at the gates of London in 1461, Jacquetta was asked to negotiate with Margaret of Anjou to keep the Yorkist army from vandalizing the city. The husband of Jacquetta’s eldest daughter, Elizabeth Woodville, Sir John Grey, fought in the Second Battle of St. Albans with the Lancastrian army under the command of Margaret of Anjou. Though the Lancastrians won, Grey was among the casualties of the battle. After the battle of Towton, won by the Yorkists, Jacquetta’s husband and her son Anthony, part of the losing side, were imprisoned in the Tower of London. Jacquetta’s family connections to the duke of Burgundy, who had helped Edward win that battle, likely saved Jacquetta’s husband and son, and they were released after a few months. Edward IV’s victory meant, among the other losses, that Jacquetta’s lands were confiscated by the new king. So were those of other families that had been on the Lancastrian side, including Jacquetta’s daughter, Elizabeth, who was left a widow with two young boys. Edward’s victory also represented an opportunity to marry the new king to a foreign princess who would bring wealth and allies to England. Edward’s mother, Cecily Neville, and his cousin, Richard Neville, Earl of Warwick (known as the Kingmaker), were shocked when Edward secretly and suddenly married the young Lancastrian widow, Elizabeth Woodville, Jacquetta’s oldest daughter. The king had met Elizabeth, according to what may be more legend than truth, when she positioned herself at the side of the road, with her two sons from her first marriage, to catch the king’s eye as he passed on a hunting trip, and beg him for the return of her lands and income. Some have alleged that Jacquetta arranged this encounter. The king was struck with Elizabeth, and, when she refused to become his mistress (so the story goes), he married her. The wedding was held at Grafton on May 1, 1464, with only Edward, Elizabeth, Jacquetta, the priest and two women attendants present. It changed the fortunes of the Woodville family considerably after it was disclosed months later. The very large Woodville family benefited from their new status as relatives of the York king. In February after the wedding, Edward ordered Jacquetta’s dower rights restored, and thus her income. Edward appointed her husband the treasurer of England and Earl Rivers. Several of Jacquetta’s other children found favorably marriages in this new environment. The most infamous was the marriage of her 20-year-old son, John, to Katherine Neville, Duchess of Norfolk. Katherine was the sister of Edward IV’s mother, as well as an aunt of Warwick the Kingmaker, and at least 65 years old when she married John. Katherine had outlived three husbands already, and, as it turned out, would outlive John as well. Warwick, who had been thwarted in his plans for Edward’s marriage, and who had been pushed out of favor by the Woodvilles, changed sides, and decided to support Henry VI as fighting again broke out between the York and Lancaster sides in the complicated wars of succession. Elizabeth Woodville and her children had to seek sanctuary, along with Jacquetta. 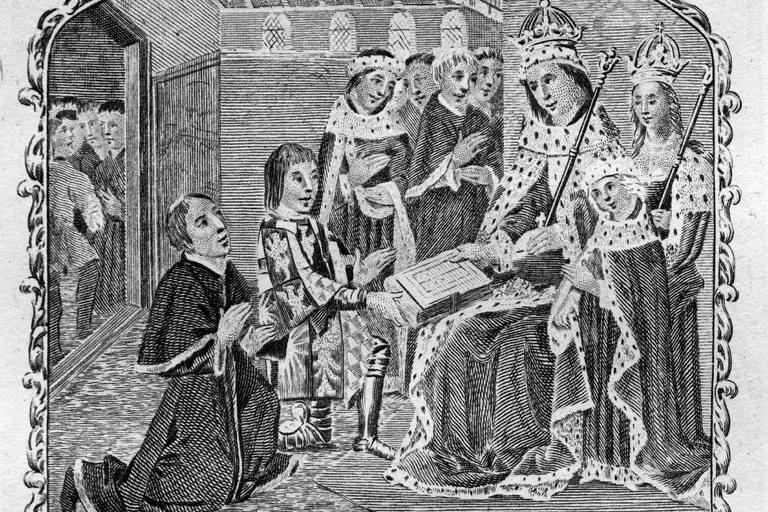 Elizabeth's son, Edward V, was probably born during that time. At Kenilworth, Jacquetta’s husband, Earl Rivers, and their son, John (who had married Warwick’s elderly aunt) were captured by Warwick and he had them killed. Jacquetta, who had loved her husband, went into mourning, and her health suffered. Jacquetta of Luxembourg, Duchess of Bedford, died on May 30, 1472. Neither her will nor her place of burial is known. In 1470, one of Warwick’s men formally accused Jacquetta of practicing witchcraft by making images of Warwick, Edward IV and his queen, likely part of the strategy to further destroy the Woodvilles. She faced a trial, but was cleared of all charges. Richard III resurrected the charge after the death of Edward IV, with Parliament’s assent, as part of the act declaring invalid the marriage of Edward to Elizabeth Woodville, and thus removing from succession Edward’s two sons (the Princes in the Tower Richard imprisoned and who were, after a while, never seen again). The main argument against the marriage was a supposed precontract that Edward had made with another woman, but the witchcraft charge was inserted to show that Jacquetta had worked with Elizabeth to enchant Edward, Richard’s brother. Jacquetta appears often in historical fiction. Philippa Gregory’s novel, The Lady of the Rivers, focuses on Jacquetta, and she is a major figure in both Gregory’s novel The White Queen and the 2013 television series by the same name. Jacquetta’s first husband, John of Lancaster, the Duke of Bedford, is a character in Shakespeare’s Henry IV, parts 1 and 2, in Henry V, and in Henry VI part 1. Mother: Margaret of Baux (Margherita del Balzo), whose paternal ancestors were nobility of Naples, and whose mother, an Orsini, was a descendant of King John of England. Father: Peter (Pierre) of Luxembourg, Count of Saint-Pol and Count of Brienne. Peter’s ancestors included King Henry III of England and his consort, Eleanor of Provence. Louis of Luxembourg, Count of Saint-Pol. Ancestor of Henry IV of France and Mary, Queen of Scots. Beheaded for treason against King Louis XI of France. Husband: John of Lancaster, Duke of Bedford (1389 – 1435). Married April 22, 1433. John was the third son of Henry IV of England and his wife, Mary de Bohun; Henry IV was the son of John of Gaunt and his first wife, the Lancaster heiress, Blanche. John was thus the brother of King Henry V. He had previously been married to Anne of Burgundy from 1423 until her death in 1432. John of Lancaster died on September 15, 1435, in Rouen. Jacquetta retained the title for life of Duchess of Bedford, as it was a higher-ranking title than others she might later have been entitled to. Elizabeth Woodville (1437 – 1492). Married Thomas Gray, then married Edward IV. Children by both husbands. Mother of Edward V and Elizabeth of York. Lewis Wydeville or Woodville. He died in childhood. Anne Woodville (1439 – 1489). Married William Bourchier, son of Henry Bourchier and Isabel of Cambridge. Married Edward Wingfield. Married George Grey, son of Edmund Grey and Katherine Percy. Anthony Woodville (1440-42 - 25 Jun 1483). Married Elizabeth de Scales, then married Mary Fitz-Lewis. Executed with his nephew Richard Grey by King Richard III. John Woodville (1444/45 - 12 Aug 1469). Married the much-older Katherine Neville, Dowager Duchess of Norfolk, daughter of Ralph Neville and Joan Beaufort and sister of Cecily Neville, his sister Elizabeth’s mother-in-law. Jacquetta Woodville (1444/45 – 1509). Married John le Strange, son of Richard Le Strange and Elizabeth de Cobham. Lionel Woodville (1446 - about 23 Jun 1484). Bishop of Salisbury. Richard Woodville. (? - 06 Mar 1491). Martha Woodville (1450 – 1500). Married John Bromley. Eleanor Woodville (1452 - about 1512). Married Anthony Grey. Margaret Woodville (1455 – 1491). Married Thomas FitzAlan, son of William FitzAlan and Joan Neville. Edward Woodville. (? – 1488). Mary Woodville (1456 - ?). Married William Herbert, son of William Herbert and Anne Devereux. Catherine Woodville (1458 - 18 May 1497). Married Henry Stafford, son of Humphrey Stafford and Margaret Beaufort (a paternal first cousin of the Margaret Beaufort who married Edmund Tudor and was the mother of Henry VII). Married Jasper Tudor, Edmund Tudor’s brother, both sons of Owen Tudor and Catherine of Valois. Married Richard Wingfield, son of John Wingfield and Elizabeth FitzLewis.